I was a bit early in my “earnings season is winding down” comment; must have been looking at the wrong week again. Not that earnings mattered…a trade war with Turkey and a falling Lira drove our downside move last week. 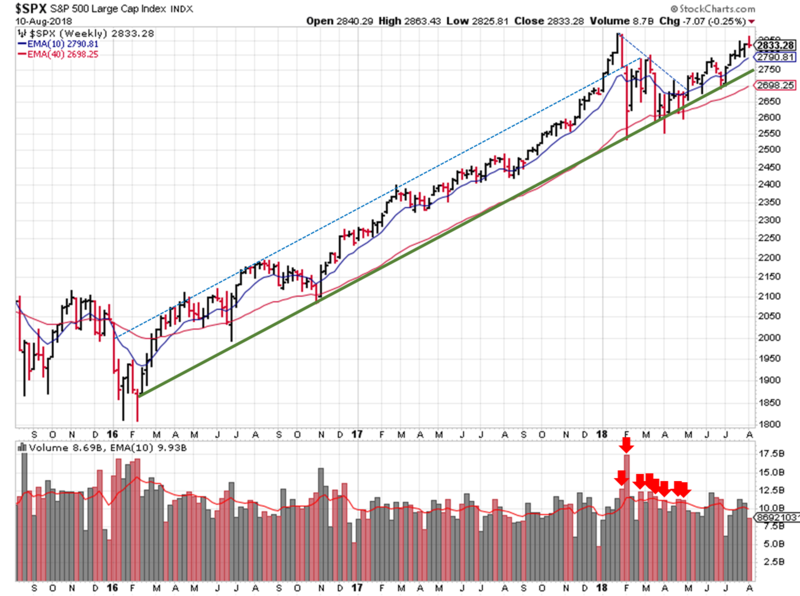 All the indexes start this week above their 50 day, and only the NYSE is below it’s 20. 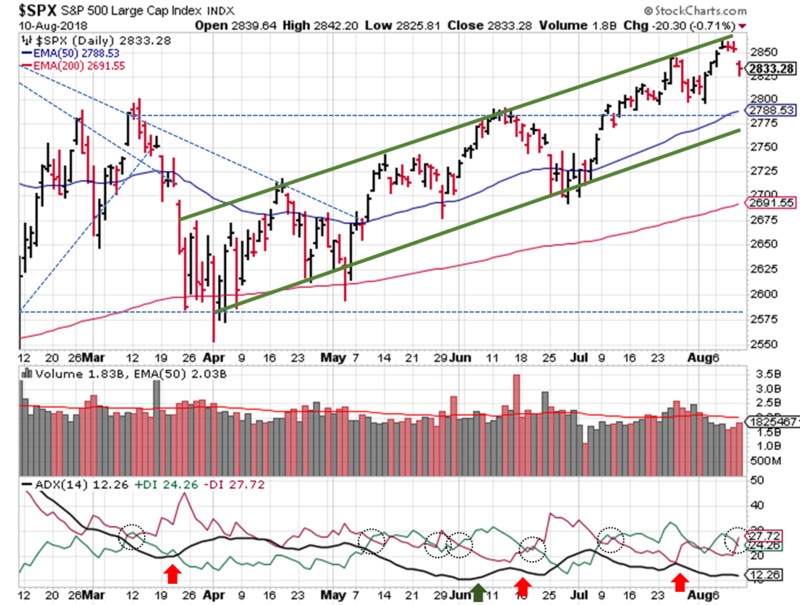 The S&P ($SPX) remains firmly entrenched the rising channel we’ve been tracking. Last week, prices tested the upper trendline. And again, they headed lower afterwards. The ADX continues to show a weak trend, but a slope change and a DI- indicator spike shows what little trend we have is bearish. The chart reminds me of price action / ADX readings from mid-June…just before the S&P fell to the lower trendline of the price channel. Overall, most signs point to a positive environment for investing and trading in U.S. equities, but that lack of volume and spike in volatility is something to watch. The ADX appears to align with OEWs call for some price drops over the next week or two, but that should be a BTD opportunity. If you find this research helpful, please tell a friend. If you don’t find it helpful, tell an enemy. I share articles and other news of interest via Twitter; you can follow me @investsafely. The weekly market outlook is also posted on Facebook and Linkedin. For the detailed Elliott Wave Analysis, go to the ELLIOTT WAVE lives on by Tony Caldaro. 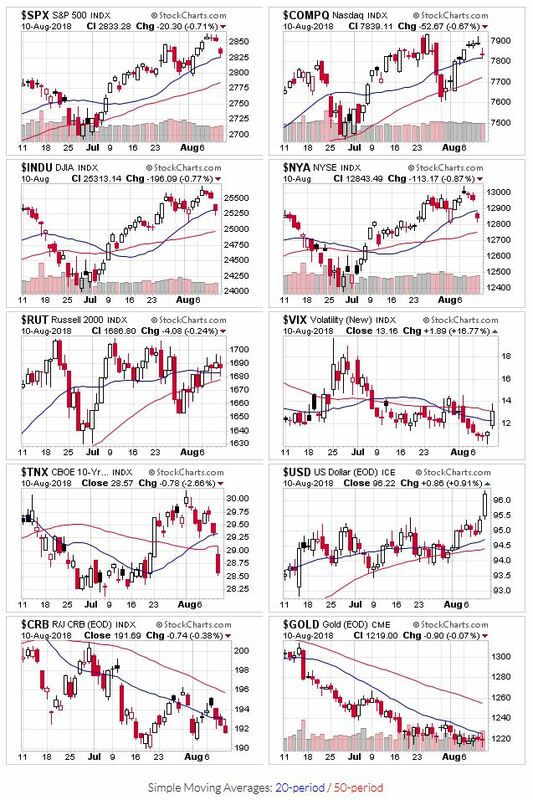 Charts provided courtesy of stockcharts.com. This entry was posted in Historical Data, Market Trends, Other Blogs and tagged elliott wave theory, investing process, safe investing, technical analysis techniques, US Stock market. Bookmark the permalink.